But it sure seemed bad enough to be classed that way to me! What a wild night we've been through here on the southern tip of Nova Scotia, Canada! Gene called me around 7:30 last evening as they headed in from where they are lobstering (it's a four to five hour steam offshore) and reported that it was rough going, and slow, and that they had already experienced plenty of miserable weather, even hail that came at them sideways! At that time they were at German Banks and steaming at 7 knots so it was still going to be a long night plowing their way through a rough ocean. Before we ended our conversation, which kept getting interrupted due to what Gene termed as 'a bad connection, Mom!' he said that they were now getting lightning. Within twenty minutes Gene's lightning was here with us and things were furious and loud as the two fronts collided overhead. When the weather is really bad like this we leave a drift of snow to the left of the back door so that Dream doesn't have to go far to do her duties and can duck right back inside afterwards. As Shel opened the door and gave a tug on her leash to urge her forward she impersonated a mule with a most stubborn will! I know she thought her Daddy had taken leave of his senses. He wanted her to go out there?! Had he been hit by a lightning strike and no one noticed?! Superior strength overcame Basenji (mule) will and duties were taken care of in split second timing! Whew! Glad that's done until tomorrow morning, but nights aren't long here at Wine Brook Cottage. The new day began with Gene's arrival home shortly after 3AM. A hugh weight is lifted from our hearts and minds and two silent thankful prayers wing Heavenward as we hear his truck turn into the driveway and the beam of his headlights shine through the bedroom curtains and onto the walls signalling the safe return of our resident sailor. There is no feeling of annoyance at the clamor in the kitchen as he makes himself a chicken sandwich snack and the TV in the family room is turned on. It will soon be time for Shel to get up and head out on the tractor in order to get an early start to the snowplowing and it's close enough to my usual rising time so I'll join my DH and DS for a short chat before one drifts off to sleep and the other bundles up and heads out the door. Thank You Lord . . . . I whisper as my day begins . . . . Thank You! 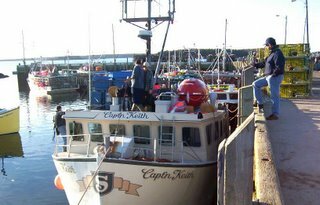 When I was in Nova Scotia I realized some of the feeling associated with the men going out on the boats. I understand even better now. Thank you Leslie ..... Whenever Gene leaves to go out on the ocean there is a part of me that wishes I could stop him and make him stay on land, but he is a grown man and the sea is his choice, and in his blood. My fears are perhaps heightened somewhat as he has already survived a shipwreck, so I'll cheerfully say 'See ya later' each time he leaves and cover him in prayer while he is out there. We cannot tie our children to our apronstrings. They must fly free on their own wings. I feel for you having a family member out lobstering in such extreme conditions......but the call of the sea is generally stronger than mum's apron strings!